I haven`t posted for awhile has I have been busy stitching a none HAED which was completed last week and I am now back stitching my HAED's which I am enjoying. "Envy" Pgs 14,15 and "Lust"
Wow there are some fantastic work out there! Everyones pieces are looking great! Here is a update on "Envy" and "Lust" I've been off on Holiday this week, and the weather has been bad......So I have had lots of time for stitching.......First I wanted to get Pgs 14 and 15 finished on "Envy"
I moved over to the other side so I could do some Dress and Background! The 3 pages in the Middle are just dress so I wanted a break from that. I also gave her a quick steam with the Iron, Just to freshened it up and to take out the hoop marks! The ruffle at the bottom is done and looks great IMHO! And here is the page done! I'm excited about the next page as It has Some Arm. Overall I'm happy with how they are both going. This is the end of my first month of stitching Ruth Sanderson's Fall Fairy. 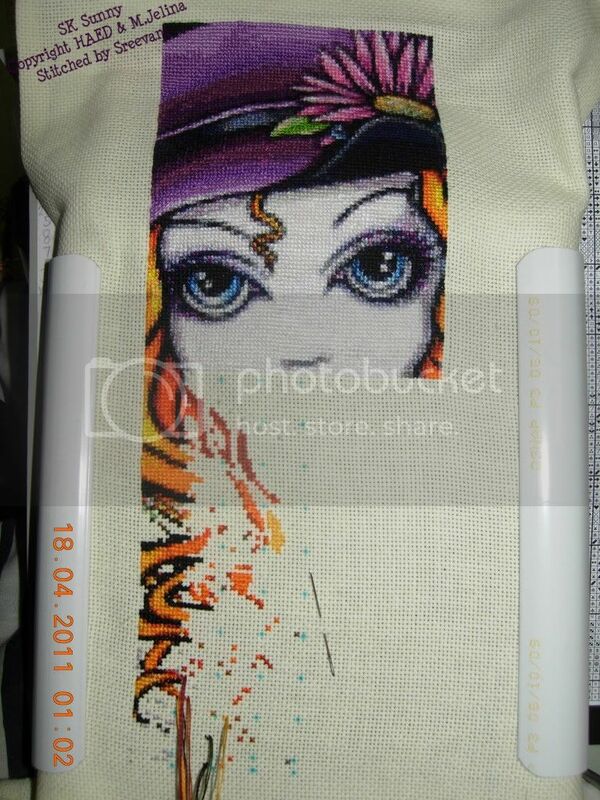 I am stitching on 20 count aida. 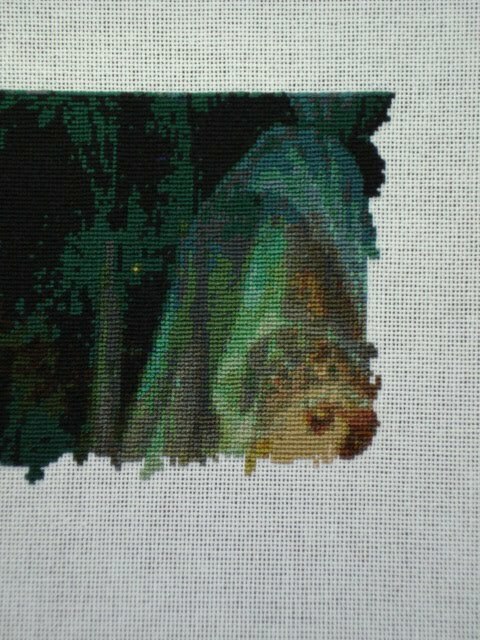 The colours are coming out great and I love watching it progress, there are only some leaves at the moment but I am just about to start the first small fairy. Wow, the month of April was so beautiful that I only did1.5 pages of The First Rose. We did a lot of motorcycling. Looked at the Tulips in the west and sat on a terrace in Maastricht in the South. And been underground in Maastricht caves. Luckily I had my motorcycle jacket on. We had no cold. In June I will go further again with The Rose. Then comes out the front of the dress. The day after tomorrow is Queensday. And on May 1st I'll continue with the Medusa. Situated on the weather, of how many I do in May. Everybody has great projects on there hands. !! One morning, I opened my eyes and I listened attentively. I discerned little sobs and murmurs. I must confess that I don’t feel well in my life since a too long time now. I had very bad troubles, and very hard moments without the necessary strength to overcome them. “How ?” did I ask to her. And that’s how I finished the page 3, not without difficulty, but she was right. She helped me. Today, it is with a great and enormous pleasure that I’m sharing this with you all. I hope that you will like the pictures. 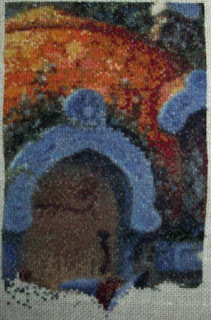 It is stitched on 28 count, with two strands of threads. Stitching... Sometimes a lifebuoy, sometimes an outlet ... But always a precious journey. I rewarded myself with another new start when I got to the half way point of SK Fragile >g< My new one is SK Logan. I haven't done the metallic thread yet on this one. As I need to see what looks best on 18 ct. and open to suggestions. starting them before I get back to my first one QS Dragon Soul ! I've been quite busy with this over the past few days and can't put this down at the moment and have managed about 1,800 stitches since I finished the first chart page. The detail is amazing and you can just see the Munchkin's hat appearing in front of the door. Back to work tomorrow so stitching will have to wait for a few days but I'm only in work for 2 days this week and then have another 4 days off so another update soon. I have completed yet another page! It took me 6 days again. It took me about 9 days to complete a page on 'The Waiting' so I am much faster at the moment. I would like to thank everyone for all their lovely comments. I do read them all and I do love getting them. It motivates me to keep going! So thank you! 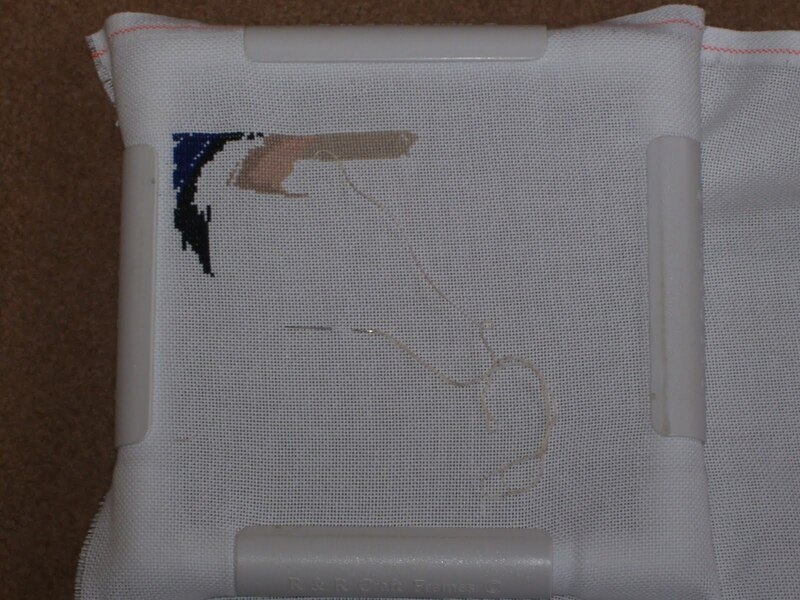 Even a forced rest after a short hospital stay is good for something... for example I can spend my whole day stitching :) I think it's pretty visible on my wips. 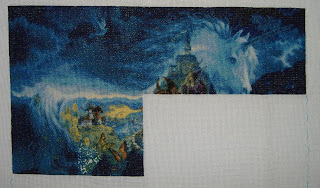 There's not much left to be done from the 7th page of the Unicorn, by next week it'll be complete! And Gaudí's sky just kept growing. A Finish! SK "Butterflies Galore"
I finally have a Finish to show you all! Now I'm known to be a little crazy in my stitching, as in I do crazy things with Time frames! So It was one of the ladies at works birthdays on the 20th, I was deciding what to do as a gift, She really likes Butterflies, and We had picked out a QS "Butterfly Keeper" However I had not made a start. So when she brought It up I said I hadn't started and she sounded a little disappointed! We cant have that now! So I brought SK "Butterflies Galore" on the 4th of April! Which left me 16 Days to Complete! Finished Product! SK "Butterflies Galore"
Day 14! Finished washed Ironed! When I finished there was the Overwhelming sense of Achievement! I was also very tired! 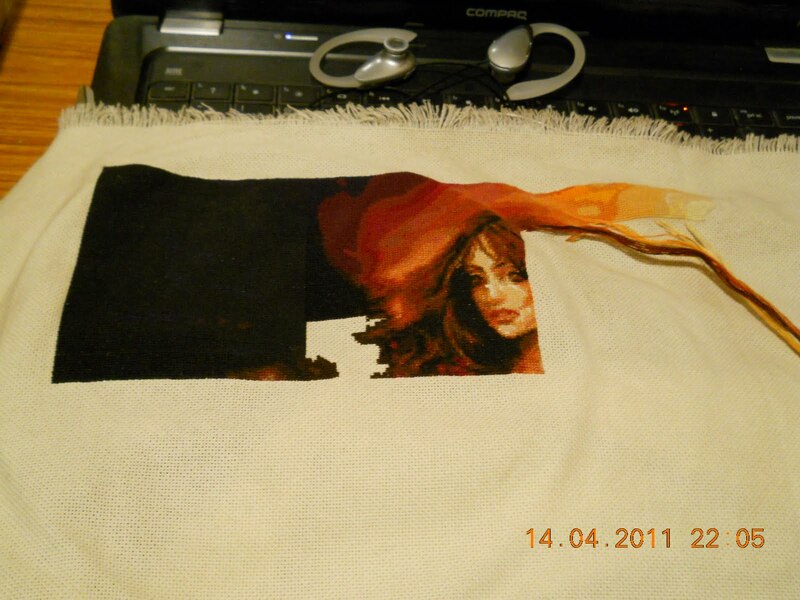 I had to do at least 1000 stitches a night to get it done on time, so it was 2 weeks of late nights but so so worth it! Happy Stitching all! Sorry its a long post! 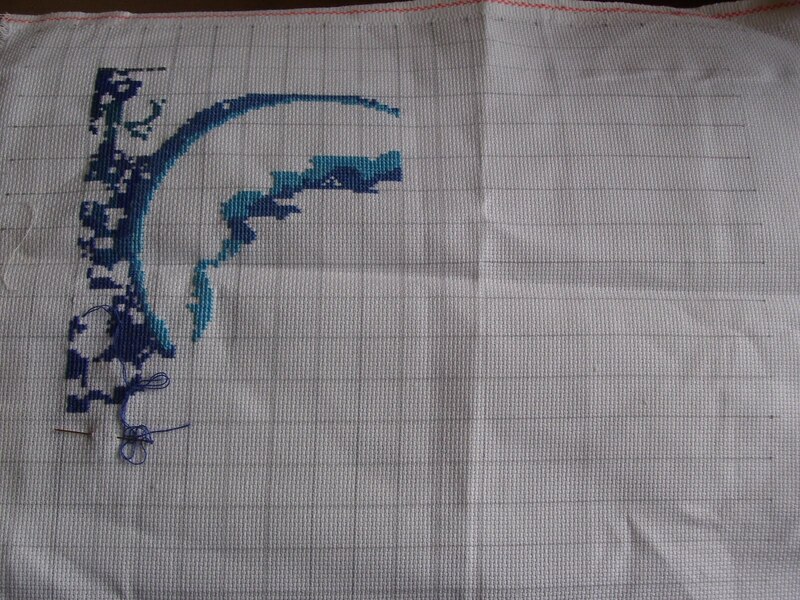 Last week we had a total internet failure for 3 days so I had the perfect reason to get stitching and I finally managed to finish page 1 of my chart yesterday. 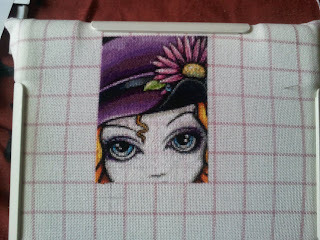 I was enjoying stitching so carried on with another page﻿. I think I'm starting to like this project again especially as there doesn't seem to be many confetti stitches on this page just lots of blocks of colour. Here's some new updates from my buddy Vani! Hi everyone! 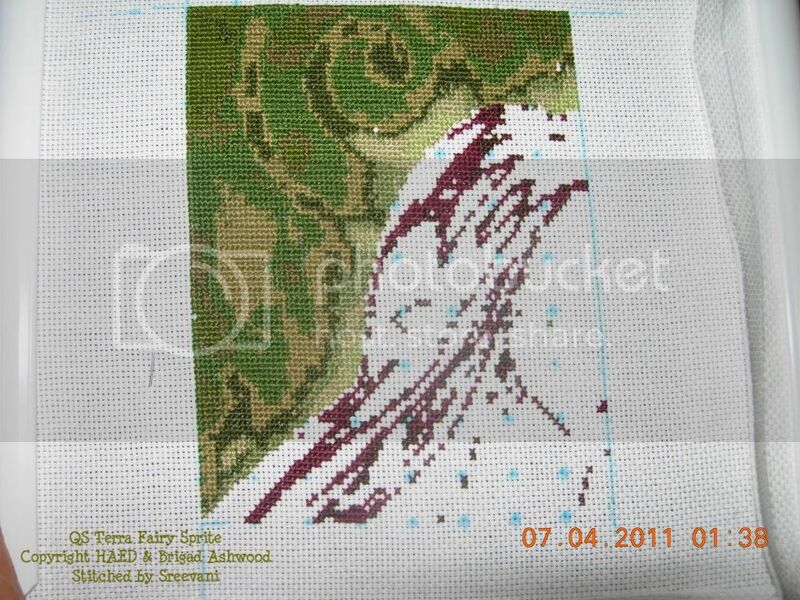 I would like to share with you my 1st page finish on QS Terra Fairy Sprite! 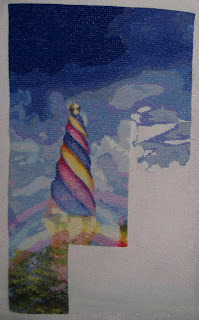 Now I have been working on my SK Sunny, some very bright colors, makes for some interesting stitching! There is a lot of time since my last update, but I was too busy to stitch and my work was growing very slow. I’ve got to finish the wings and the next step will be the dress. I would like to show you very soon. With 2 pages of black left to do, I caved in and started adding some colour to her face. I decided to join the detail/confetti sal on the BB. Well I hope you all like my work from yesterday. Stitched on 18ct 2x1 full crosses. It's been a while since I posted any wips so, although I haven't quite finished a page, I thought I would show you my new start. It's the gorgeous JBG released for the Japan fundraiser. 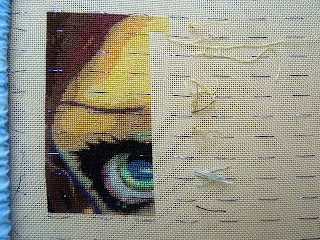 She is stitching up beautifully and as usual, the eye is amazing! I am stitching her on my usual 28ct jobelan - this time in bone, 1 over 1 and full crosses. I started her on 26 March and have named her "Usagi" which (if Google is correct!) is Japanese for rabbit. Since this photo was taken I have finished another column so I hope to have a page finish soon! Here's my progress on TT A Pale Comparison after a tricky page where I had to frog her forehead as the colour was totally wrong! I got there in the end though and here she is with just one page to go until she's finished!! I'm going back to Fairy Melody until I go into hospital on May 3rd and am hoping to get a couple of pages done! Also trying desperately to persuade DH to let me get four charts in the HAED sale (A Portrait of Ophelia (JBG), QS See A Butterfly (Kuik), QS Waiting (Kuik) and QS Getting Wild (Kuik) but he's not having it at the moment, got until the end of the day so fingers and toes crossed LOL!!!! This is my latest progress. I just finished another set of pages late last night. I've only got one full page and a partial page left. I can't wait to put that last stitch in and then get it ready to be sent off to the framer. I've decided to pay the money for Jill Rensel to do it since it's for my son and I want the framing to be extra special. Thanks for looking and happy stitching. Hello! I havent sent in an update in a while. I took a week off to play some playstation and then I got in some replacement thread for a kit I was working on for my wife. I also got some more black in, and finished all of page 1! Nearly done with page 2 also, although there are a few squares in the face I cannot finish until I get two more colors I forgot to order when I ordered the rest. Major confetti stitching with 60 colors ~ good thing I like pink & he's cute ! With the arrival of spring, I wanted to change colors. So I abandoned the first line to return to the beginning of the sencond line (page 10). I look forward to the faces emerge !!! So, seven pages are done, 8th is started (page 11). Stay tuned for more !!! Here is my update on "Green Dragonling" by Jasmine Becket Griffith. I've finished my first page (page 15) and I'm curently working on page 14. I started with the black on this new page. 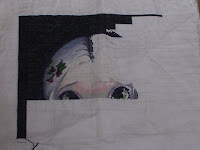 There are some confetti stitches to come to finish the eye and start the ear. I really love her eye, so expressive !! I stitch on 25ct evenweave. 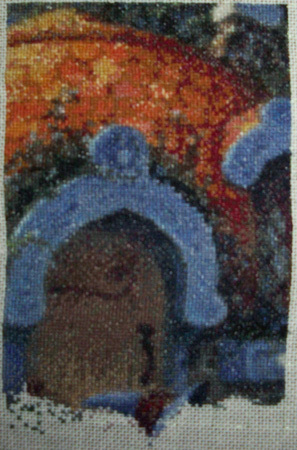 I've made 6470 stitches so far. I had a go at using linen a couple of days ago. 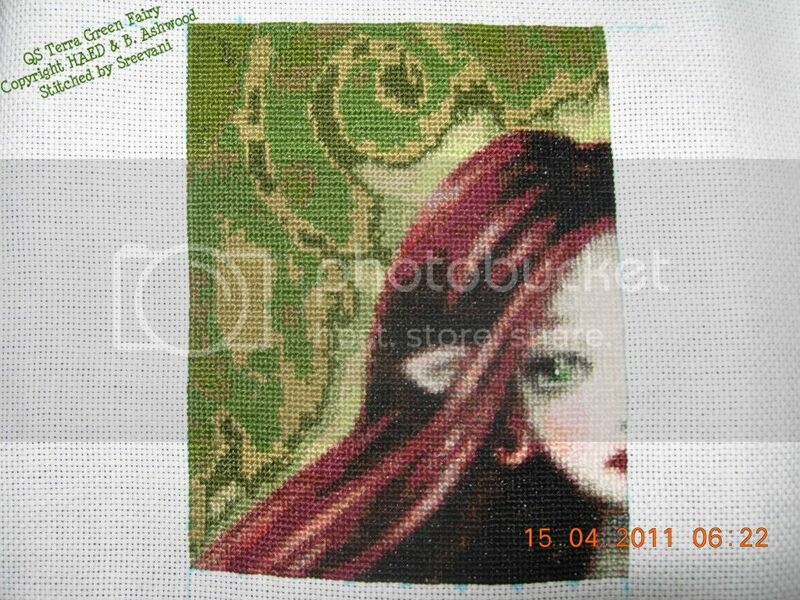 A lady gave me a cross stitch kit that uses linen and I love it! In fact I briefly considered restarting The Lights of Home on linen but I have done too much to do that. But after this I will be using linen from now on for sure! To prevent any confusion my buddy Ewa has asked me to change her name to mrs. Macaw. 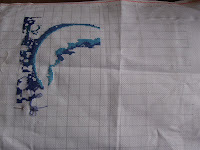 In each stage of my cancer treatment, I have started a new embroidery. I started up this one when I would have my last breast reconstruction operation but the plastic surgeon was home in bed with the flue so I just had to go home again. :( But on Thursday 14th it will be done, so please keep your fingers crossed! 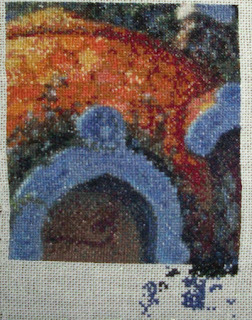 I stitch on 25 ct, 1 over 1, with one strand of DMC 25. I've made some progress on Xmas- finally the little girl's face is nearly finished. 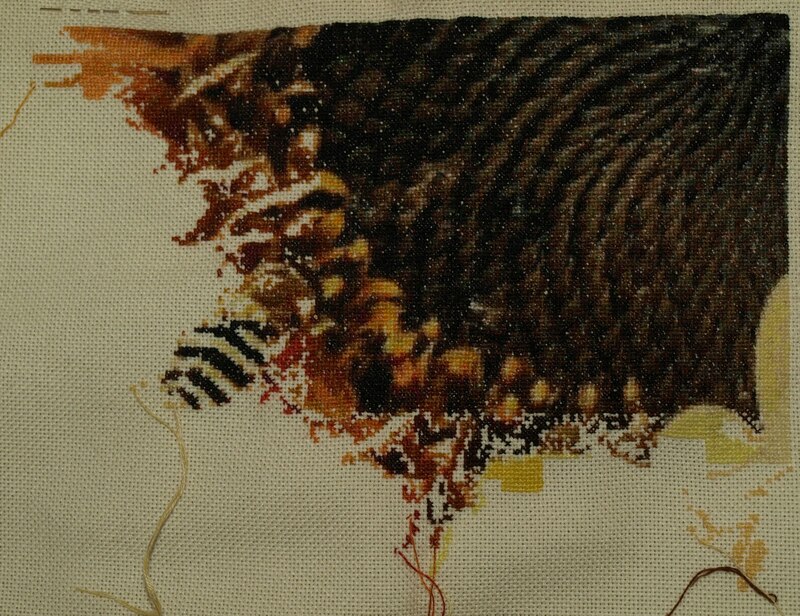 I'm really enjoying stitching this piece- watching the details emerge. And just a little progress on QS Rapture. Afternoon Tea. Page 1 finished.